Today the hopeful applicants of #PitchWars had the chance to ask questions of the 70+ mentors for the contest. We had spectacular participation during both 1-hour chat sessions! At one point I realized I’d fallen 20 minutes and 170 tweets behind on the #AskMentor hashtag (which was trending on Twitter). Talk about exciting! Because it was such a crazy time, and not everyone could make both windows, I thought I’d address some frequently-asked questions and share some highlights. Many questions centered on the submission process, which is a little bit different from last year. What will I include in my submission? You will provide your name, e-mail address, and the title of your book. 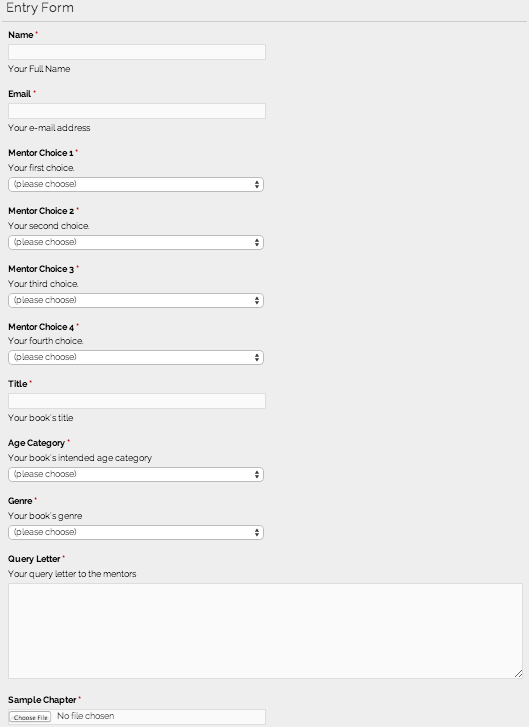 You’ll choose an age category (MG, YA, NA, A) and genre from pull-down menus. You’ll choose up to four mentors. You’ll also provide a query letter (this is a big text box). No special formatting, but line breaks are preserved. Lastly, you’ll include your first chapter as a .doc or .docx attachment. How should I begin my query? Can I personalize it? The simplest address to open your query would be “Dear Mentors,” and I think that’s just fine. You can’t really personalize beyond that, as this submission will go to all four mentors. What should I include in my query? It should resemble a standard query that you’d send to a literary agent. Make sure to include your word count. Most mentors would like a brief author bio at the end (even if you don’t have writing credits). Does the order of the mentor choices matter? No, it doesn’t matter which mentor you put as choice 1, 2, 3, or 4. All choices will be considered to be equal. I apologize for the brief period of confusion in which I stated that you had to rank mentors! If in doubt, go alphabetical (that’s how the pull-down menus are organized). Do I have to choose four mentors? No, but it’s probably a good idea to do so. Each mentor gets to pick 2 mentees (a pick and an alternate), so the more who consider your submission, the better your chances will be. There were also some questions about the first chapter that accompanies your submission as a writing sample. Which chapter should I include? It should be the first chapter of your completed manuscript. Not the chapter “where things really start to get good.” I can’t stress the importance of this writing sample enough. For me, it’s more important than the query letter. We can fix the query letter easily, but I can’t teach you how to write at a publishable level in 2 months. How long should the chapter be? This is a matter of mentor preference. Personally, I’m looking for an adult project, and I’m comfortable with chapters in the 2500-5000 word range. This may change depending on the mentor and age category, but as a general rule, for the purposes of the submission, 500 words is too short and 10,000 is too long. What if I have a prologue? Should that be included? Here’s a hot topic on which there’s not a consensus. A lot of us who have worked with editors/agents will tell you that most are not fans of prologues. Your book should start right in the action with the main character, in my opinion. If it truly does that, it’s not a prologue. It’s chapter 1. For this contest, however, my position is that you should provide the best “first chapter” that you can — so if I’ll be lost without your prologue, or it’s the best and most polished writing you have, you should use that for your chapter 1. As a first-time mentor, I’m sure I had as much fun getting to know the other mentors as anyone else did. 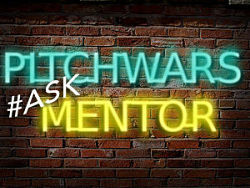 Many #PitchWars hopefuls were curious about what mentors are looking for in a mentee, what they’ll consider in making their decisions, and how that relationship will work. Will mentors ask for more chapters or a synopsis before choosing mentees? It’s likely that if you get very far with a mentor, you might be asked to provide more chapters. A synopsis request is also possible, depending on the mentor. Look, virtually all authors hate writing synopses, but it’s part of the game. I highly recommend Anne Mini’s guide on how to write a 1, 3, or 5 page synopsis. Is it important to have a blog/social media presence? Is it vital? No. The general consensus among mentors was that the writing comes first. That’s what we’ll judge submissions on, and use to narrow our list of choices. However, a lot of us (myself included) will look at that sort of thing as we finalize our picks. We have to make sure that you’re not a crazy person, and that you haven’t been out bashing agents/editors/publishing on every social media channel. In other words, prepare yourself to be Googled! How will mentors work/communicate with mentees? The answers to this kind of question varied somewhat across mentors. A lot of us are anti-telephone and would prefer e-mail or online chat. Actual revisions/changes might be exchanged in MS-Word files with Track Changes, or Google Docs. I think most mentors are flexible on this. Mentees should probably expect a fair amount of back-and-forth during the ~2 month revision period. Many Pitch Wars hopefuls wanted to know about the timeline for the contest, when they might hear something (even a hint) about their chances, etc. In short, submissions are due August 18, mentees/alternates are announced September 3, and the agent round is November 4-5. 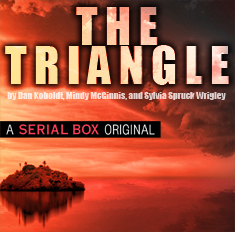 See the Brenda Drake contest schedule page for details. Will mentors be dropping any hints before September 3? Some of us will be Tweeting out some teasers as we go through the slush, so keep an eye on the #PitchWars hashtag. If you’re asked for more material (chapters, synopsis, etc. ), that’s a good sign. What if I’m picked but get signed by an agent/editor during the contest? That would be awesome! You should tell your mentor right away. It’s not a big deal; it’s why each mentor chooses an alternate. I did field some questions about myself as a mentor, including taste and preferences. I’d recommend that you read my mentor bio, but don’t be put off by the fact that I’m a scientist. 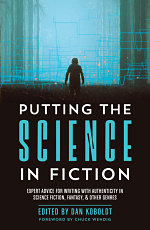 If there’s something incorrect or questionable about the science in your sci-fi/thriller, or a concern about the horses/archery in your fantasy, we’ll fix it. That’s what I’m here for. Nor should you worry if your submission has a prologue, or is currently at 120K. We’ll work on that, too. I think that a debut novel (even in sci-fi or fantasy) should shoot for 100K and not go much above it. Luckily, we SFF writers tend to world-build a little too much, so there are often areas to cut. On the other hand, if your adult sci-fi or fantasy is below 90K, we might talk about adding to it. It’s my first year as a mentor, but I had as much fun as anyone yesterday during the #AskMentor chat sessions. I enjoyed the sage replies from Dannie Morin and Veronica Bartles. I laughed at just about everything Julie Sondra Decker said. And I enjoyed the excellent questions put forth by you #PitchWars hopefuls. Thank you for making it such a great event! I just want to clarify that not getting a request from a mentor for more pages or a synopsis, etc. doesn’t necessarily mean bad news. Last year, I knew just from the query and first pages in the initial submission which mentee I would choose. I had a 16-way tie for my alternate slots, though, and I had to request more pages from those to narrow it down. I missed the day. Thank you for the summary. Thanks for the shoutout, Dan! Nice recap! I’m a biostatistician and doing genetics research is an “occupational hazard” to me :), so I’m sure I’ve missed some nuances in terminology. I hope you won’t lynch me if I muck it up! I’m happy to correct any genetics mistakes if you’ll do the same for me on biostats!